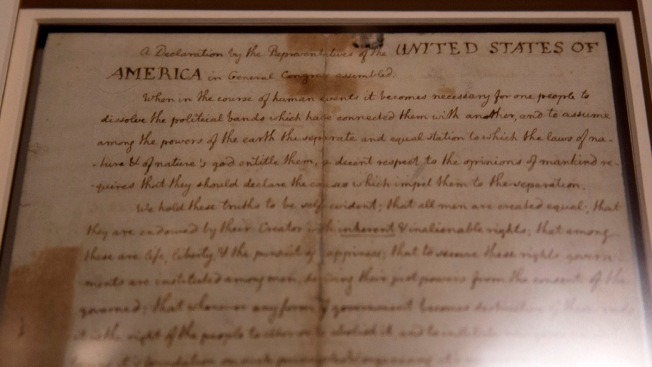 This March 11, 2015, file photo, shows Thomas Jefferson's handwritten copy of the Declaration of Independence at The British Library in London, England. In anticipation of Fourth of July, a Texas-based publisher posted various passages from the Declaration of Independence on its Facebook page in an attempt to make it “a little easier to digest,” according to NBC News. But Facebook’s algorithm detected the phrase “merciless Indian savages” and flagged the passage that features those words as hate speech. The passage was flagged at a time when Facebook is using a combination of humans and artificial intelligence to prevent hate speech from spreading across the social media network. Facebook eventually apologized, and the publisher’s post was restored.